This is a great original photograph of General Patton taken during the last months of World War Two. Patton was one of the greatest American field generals and was also the very first American in the Tank Corps in the First World War. There is a saying that there are many capable of leading a squad, some who can lead regiments, fewer who can lead divisions, but only a handful have the field vision or dynamic intelligence to lead an entire Army into battle. Patton had the rare gift of field vision. He not only lead armies, he did so with ease. In Dec. 1944, he did something no officer had ever done in the history of warfare when he pivoted an entire army of several hundred thousand men off of a front and into the Battle of the Bulge in less than 48 hours. That this was accomplished before the age of modern communications is all the more amazing. It is said he went into the meeting with Eisenhower over how to counter the German offensive into Belgium with at least three pre-formed plans, one of which he would radio to his staff to instantly spring in motion once the meeting concluded. The speed at which Patton's 3rd Army moved off the Siegfried Line in France and into Belgium not only helped relieve the Americans surrounded at Bastogne, it stunned the Germans preventing reinforcements and supplies from reaching Belgium. This saved thousands of Allied lives and shaved several months off the end of the war in Europe. In the photo, Patton is wearing his sidearm on high right hip (this isn't his famous Colt Single Action but probably his Colt 1903 General Officer's Model) with his signature boots, jodhpurs (being ex-US cavalry, Patton was an avid horse rider), officer's belt, tie, green jacket, and his darker green dress helmet liner. When you see photos of Patton where he is on or near the front lines, he's usually wearing his steel pot over a liner. It also appears that he is carrying a small box or briefcase in his left hand. To the forefront of the photograph at bottom right corner, we see a glimpse of a nearby soldier's Colt Model 1911 A1 .45 Automatic Pistol in a US marked Model 1916 holster. To the other side of the scaffolding appears to be an armed guard, another man with a pad and a pencil (reporter?) and if you look very carefully, two more American soldiers in the distance. 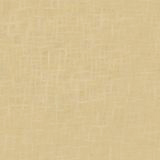 The image measures 3-1/2 x 2 inches and is in Very Good condition with no tears or discoloration. 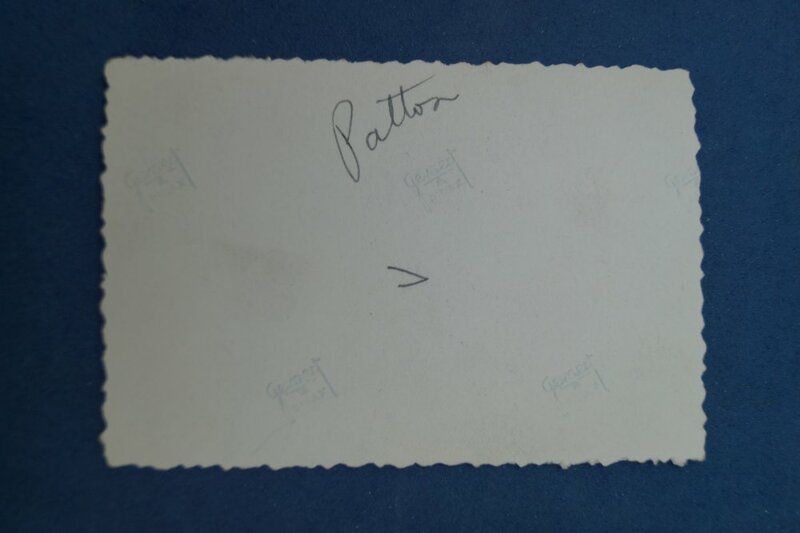 The back of the photograph is handwritten "Patton" (not his signature) in ink with the manufacturer's name, Gauvert Ridex in several places. 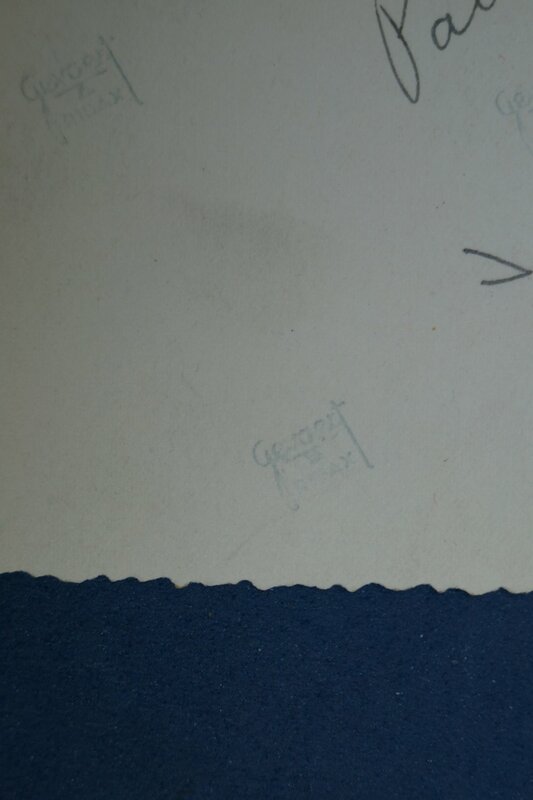 We looked this up too and it is pre-war to WW2 Belgian photographic paper which fits the timeframe of the image as the Allies had liberated Belgium and France in 1944. This is spot on for what an American soldier would have been able to acquire in 1944-45 WW2 Europe following the D-Day invasion. That said, I believe this photograph was taken around this time frame or shortly after as the 3rd Army crossed into Germany for the final push. He appears to be stepping off a set of stairs from some sort of makeshift platform. Coming off the last step, Patton looks straight towards the camera. For a 59 year old in the middle of a war, he looks to be in remarkably good health. 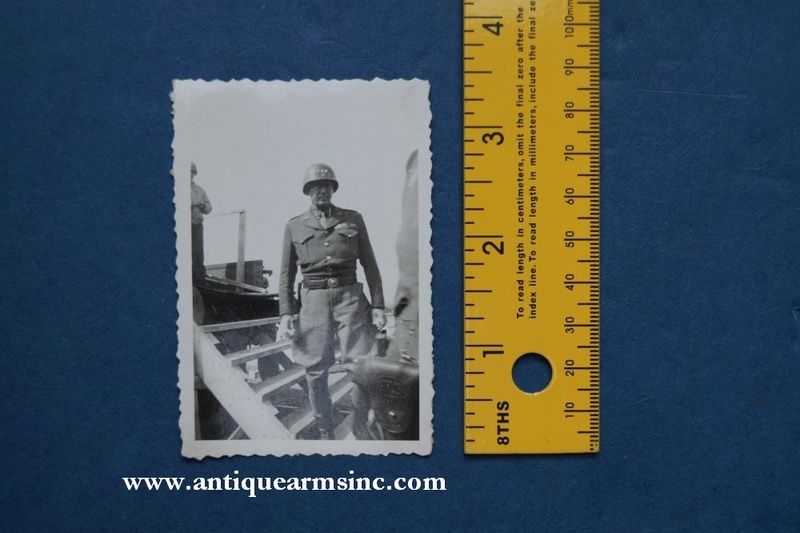 We were told by the previous owner that this photograph was taken by a soldier while Patton was inspecting a German rail yard in southern Bavaria around April to May 1945 however, I think this is a little earlier due to his rank insignia. 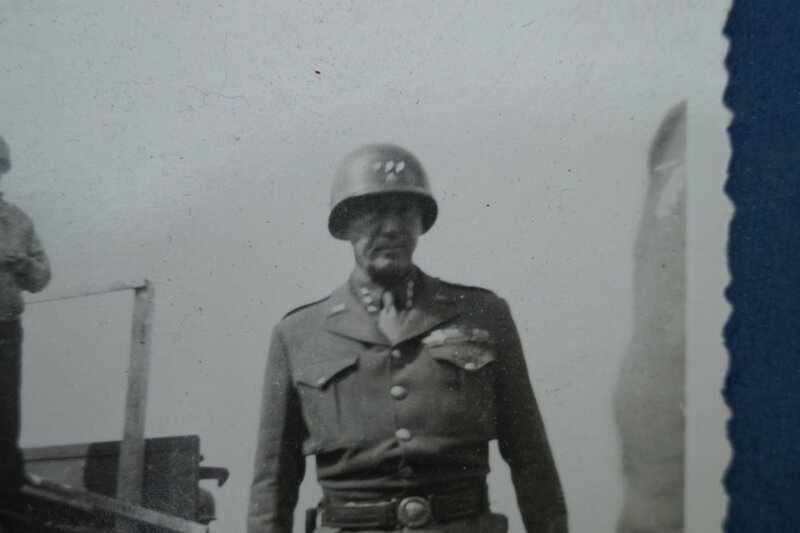 After taking a good look at his helmet and collar of his uniform and realized that he was a three-star lieutenant general at this moment in time indicating that this would have been taken before April 14, 1945 prior to his promotion to four-star general so this couldn't have been taken in May. There is no question this was taken at least a month before V-E Day on May 8, 1945 when the war in Europe was still being fought. My personal guess would be somewhere between Jan. 1945 and April 14, 1945. There is some original footage on Youtube of Patton awarding a medic named Harold Garman the Medal of Honor on March 29, 1945. In it, Patton is wearing what appears to be this exact helmet with the three stars and the circled 3rd Army "A" just beneath the rank. The "A" symbol appears to show up on his fancier helmet used in ceremonies in the early months of 1945. I've looked through a lot of photos of Patton and I can't find any from 1944 of him with it on his helmet. You just see the liner rivet with no "A". 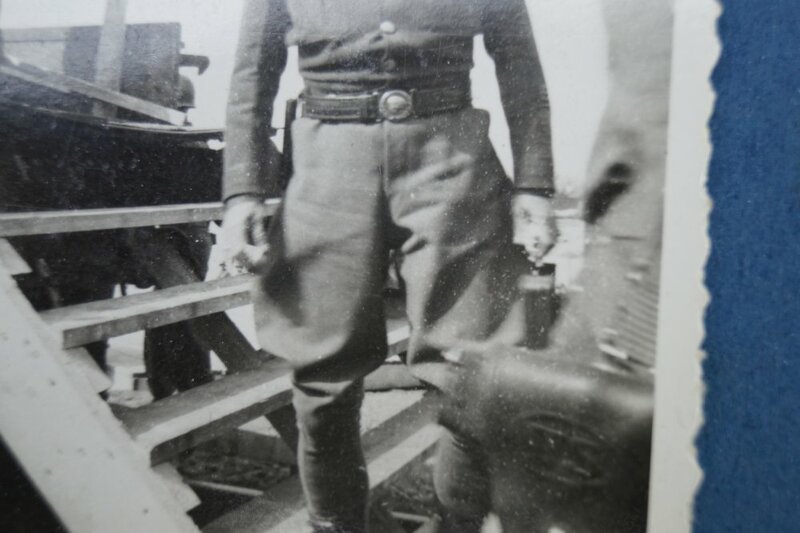 Furthermore, he is wearing the identical outfit including his smaller Colt officer's pistol as he is in the photograph. So Jan. to April 45 is the timeframe for this image. A few years ago, we found a similar impromptu image of Patton's mentor, General Pershing at the end of World War One. Patton served on Pershing's staff in Mexico 1916 and in France in WW1 before the formation of the American Tank Corps. It is interesting to have had photos of these two iconic American generals at such a similar moment in their long and storied careers a quarter of a century apart. 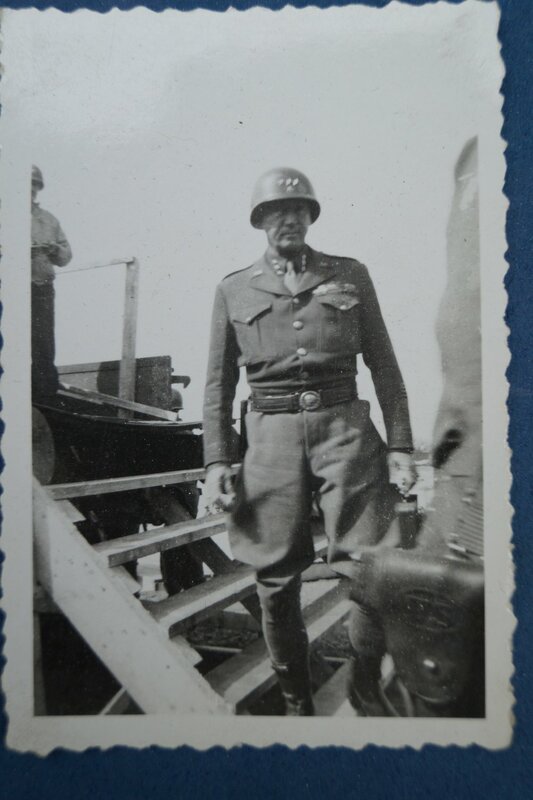 Just a fantastic unpublished wartime photo of General George S. Patton in the prime of his career.